Al is a consummate professional from start to finish. Every interaction whether via GigMasters, text or call was nothing short of first class. He showed up for the event early and was tremendously accommodating with our program. Additionally, a charming individual. I would highly recommend him for any event! Thanks, Al! Excellent experience. The Royal Piper honored our every request, but truly, with his level of professionalism and experience, required no instruction. He perfectly placed himself at two separate locations with breath-taking appearance and impeccable timing. The musical quality was superb. The Royal Piper's presence created a very dramatic effect at my wife's memorial service and burial, and all of our guests were greatly impressed. Very approachable and nice guy. Consummate professional! The Royal Piper played as guests arrived at our wedding. He arrived promptly, began playing and our wedding guests absolutely loved it! He took pictures with our guest and brought an amazing flair to our special day. Thanks so much Al! We were more than thrilled with the Royal Piper!!! He was amazing and made our wedding a very memorable experience!! He brought people to tears!! Very happy bride and groom here!! The Royal Piper really made our event! His playing was prefect and his warmth and generosity of spirit shone through! THANK YOU! Excellent working with the Royal Piper. Everyone had a great time with Al, he was responsive, timely and went the extra mile on our request. Would definitely work with him again. Al was exceptional...a gentleman, friendly, great at communicating with me, a brilliant piper...the best! Al was the best. I would not hesitate to use him again in the future, nor would I consider anyone else. Despite short notice, after committing to the event, he did everything he promised. He promptly responded to any emails and was available by phone when needed. He could not have been any more accomodating. I highly recommend him if you need a pjper. I had a wonderful experience working with the Royal Piper. He was very accommodating, answered all of my emails and questions, and made my wedding day very special. He was on time, played beautifully before and after the ceremony, and was dressed very nicely. 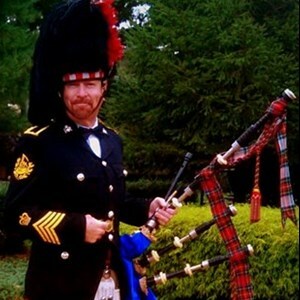 Many of my guests commented on how much they enjoyed the bagpipes and I would highly recommend using him for any event. The Royal Piper really lived up to his reputation! He played for my son's Scottish wedding. His piping was superb! He played all the two dozen or so songs I requested, and did a wonderful job. I'll be hiring him again for my other son's wedding when the time comes! Al was the perfect choice for our daughter's wedding. Personable, professional and accommodating. Responsive to all our requests, he is a great communicator and a gentleman. He pays attention to the details. An excellent musician, he played all the songs we chose. Completely engaged with the ceremony and guests, he added great personality to the event. Al came as a hired musician and left as a friend. Thank you, Al. The Royal Piper imbued our wedding ceremony with all the charm, beauty and mysticism one could hope for in a bagpipe performance. We went with "Love Divine" for our bridal party's entry, followed by a meaningful pause, and then the moment I will never forget... my bride walking down the aisle to the sound of "the Irish Wedding Song." I was so moved by this sight--and the sound of that music--that for days afterward I kept listening to the song on the Royal Piper's website. Hiring the Royal Piper was the right thing to do, and we couldn't be happier. His fee for the performance was very reasonable and his attire and manner accentuated the importance of our day. From the planning to the day of Al was a pleasure to deal with. The sound of the bagpipes was a beautiful way for the new couple to walk down the aisle and it created such an excitement for the guests...everyone was ready to celebrate! The Royal Bagpiper will always be my recommendation for anyone on the search of a professional, friendly and accommodating bagpiper. Thank you for adding to the beauty of my sister and brother in-laws wedding ceremony!